The Kawasaki Z250 will surely comes to Malaysia. Already we have the booking on Mudah and now the brochure in Bahasa Melayu for Malaysian market has already leaked. Three colours are available that is the Flat Ebony, Candy Persimmon Red and Pearl Stardust White. Get ready for the official launch this 23 October as rumored. This will make many riders happy to see the ‘baby Z800’ as we waited for long time now. 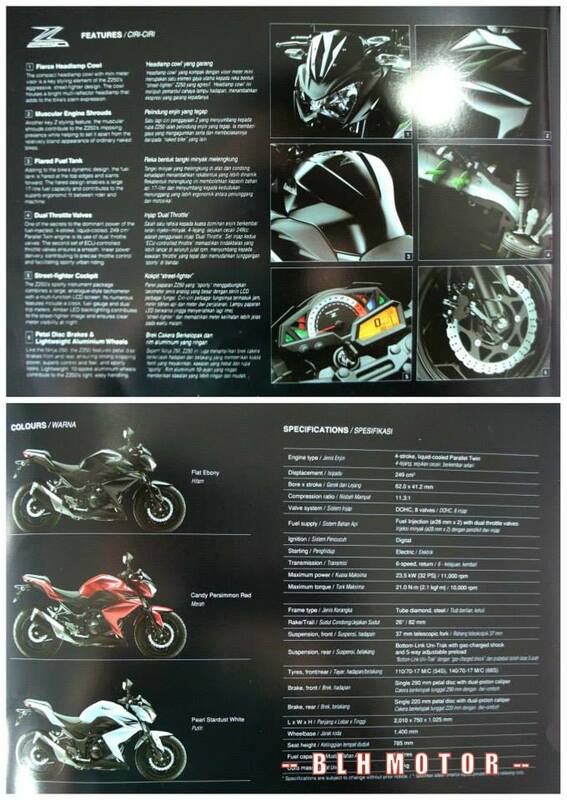 UPDATE(20/9/2013): The price of Kawasaki Z250 is probably at RM21,599 and RM23,000 OTR. UPDATE II: The launch is 24 September 2013. Harga Mark up la brader. berat 666 lagu ini….harga Z250 ini agak-agak sakit hati sikit….tak apa …sabar sikit mesti ada sinar pada harga Z250 ini kekgi..